The polls opened on Monday for general elections, including the race for the president, in the Philippines. As of press time, Rodrigo Duterte, also known as "the Donald Trump of the Philippines" has assumed a big lead with 39 percent of votes, and is believed to have secured his position as the country's next president. The 71-year-old Duterte has been mayor of Davao City for over 20 years. But his remarks are far more aggressive than those of US presidential candidate Trump. He has claimed that if he is elected, he will eliminate corruption and crime in this nation within several months and execute 100,000 criminals and dump them into Manila Bay. Not long ago, Duterte even vowed to "forget human rights." Duterte has also left a strong impression that his concept of foreign policy differs greatly to that of President Benigno Aquino III. He opposes the idea of going to war with China, wants direct negotiation with Beijing about the South China Sea, and doesn't believe in solving the conflict through an international tribunal. The overwhelming support Duterte received over and above the other contenders suggests there is strong dissatisfaction in the country with Aquino's six-year rule. Though the country enjoyed 6 percent annual growth for the past six years, the public failed to benefit from it. The electorate is also fed up with Aquino's lopsided South China Sea strategy - siding completely with Washington which brought no advantage to Manila. The public cares most about livelihoods and nationalistic slogans cannot feed them. It is reported that the 40 richest families in the Philippines own 76 percent of the country's total assets. The country is afflicted with corruption and hereditary politics, and as punishment, the Aquino-backed candidate is languishing far behind. It won't be possible for Duterte to turn the domestic Philippine political arena upside down. Being only a mayor of Davao in the past years, he has no power to move the entire nation. He was obviously bragging when asserting he would eliminate corruption in six months. In an era of rising populism, it seems that a "big mouth" can always be popular wherever they are. But if there is anything that can be changed by Duterte, it will be diplomacy. Many believe that whoever assumes office will adjust the nations' unscrupulous policy toward China. If the new leader wants to manifest his or her difference from the previous president, as well as to make achievements, improving ties with Beijing is the shortest way. China will not be too naïve to believe that a new president will bring a promising solution to the South China Sea disputes between Beijing and Manila. However, it sounds accurate that Philippine ties with China have already been through an all-time low during Aquino's presidency. 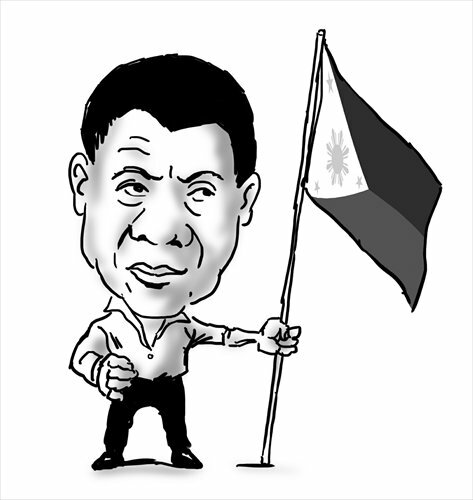 Only time will tell how far the new leader, be it Duterte or not, will go toward restoring the bilateral relationship. CCTV Foreign Affairs Reporter Su Yuting spoke with Foreign Ministry spokesman Lu Kang, for more on China's stance towards the Philippine election and the South China Sea Issue. Rodrigo Duterte, the hard-liner mayor of Davao City, seemed to be the sure winner of the presidential election in the Philippines Monday. Duterte shares different political views from the outgoing president Benigno Aquino, and how the China-Philippines relationship will develop after the election is worth exploring. The South China Sea dispute is at the core of the relationship between Beijing and Manila, yet Duterte's comments on the issue are self-contradictory. Although he suggested settling the disputes via direct negotiations with China, and proposed the principle of shelving differences and conducting joint development in the South China Sea, Duterte also vowed to ride a jet ski to Huangyan Island and plant the national flag there. Despite the above statements, Duterte is a more practical politician compared with his predecessor. The new government is expected to see adjustments in its South China Sea policy. However, the room for adjustments is squeezed by the US and the Aquino administration. To begin with, Washington and Manila have reached a series of cooperative agreements including a 10-year long Enhanced Defense Cooperation Agreement and a five-year long Southeast Asia Maritime Security Initiative. By signing these deals, the White House, on the one hand, wants to draw the Philippines over to its side, and attempts to impose restrictions on the new government's foreign policies on the other. Recently, the Pentagon, by sending warplanes in the international airspace in the vicinity of Huangyan Island, has actively intervened in the South China Sea disputes. The US is always hyping up the Huangyan Island disputes and stirring up troubles against China. The US military intervention is attempting to influence the foreign policies of the new government. Duterte's political performances will be limited by the Aquino administration as well. The Aquino government unilaterally initiated the international arbitration in 2013 and has been obstinately pushing forward arbitral proceedings regarding the South China Sea disputes ever since. "If the tribunal rules that the Reed Bank [Liyue Tan] belongs to the exclusive economic zone of the Philippines, then of course we have the right to proceed," Antonio Carpio, Supreme Court Senior Associate Justice, urged the new government to proceed with the arbitration. The National Task Force for the West Philippine Sea was also created by Aquino to unify national actions on the South China Sea issues. Before leaving the office, Aquino will still strive to manipulate public opinion and provoke nationalist sentiments against China in every possible means. The Ministry of Foreign Affairs has even introduced a Philippines Diplomatic Handbook for the new government's reference. The Aquino administration is trying every means to exert influence on the new government and force it to accept the final verdict of the arbitration. As mayor of Davao City, Duterte had limited political influence on the whole nation. Earlier, Aquino called on all presidential candidates to form a united front against Duterte. The hard-line new president is likely to face challenges from traditional elites and Manila. "The moment he [Duterte] tries to declare a revolutionary government, that is also going to be the day he will be removed from office," Senator Antonio Trillanes, a former navy officer known for the failed military uprisings in 2007 and 2003, said earlier. With his "big mouth," Duterte is seen by many as the "Donald Trump of the Philippines." His victory reflects Philippine citizens' strong dissatisfaction with Aquino's rule. The overall situation in the Philippines has not seen significant improvements in recent years. Politically, corruption is severe. Economically, the interests of the lower-class citizens have been neglected. The nation's infrastructure is in urgent need to improve as well. The Philippines is lagging far behind its Southeast Asian neighbors. It is understandable that the Philippine citizens want a hard-line leader to change the status quo. China has to be prepared for the negotiations with Duterte after the election. Despite the South China Sea disputes, Beijing and Manila have seen frequent people-to-people exchanges and strong economic ties in recent years. The two states should be prepared for direct communications to settle the disputes, and lead the bilateral relationship to a new level. If the South China Sea eventually becomes the main stage for strategic rivalries between China and the US, it will benefit China more. The whole of Chinese society will be more resolute and it means China would have the chance to solve its peripheral and strategic problems at the same time. But the US, whose acts are prompted by greed, will view the South China Sea as its burden sooner or later.